In this book, Shira Weiss elucidates the moral tradition of the Hebrew Bible by subjecting ethically challenging biblical texts to moral philosophical analysis. Examining the most essential questions of Jewish Thought, she uses contemporary philosophy to decipher Scriptural ethics as uncovered from a variety of biblical stories. Aided by ancient, medieval, and contemporary resources, Weiss presents a comprehensive discussion of enduring ethical questions that arise from biblical narrative and continue to be contested in modern times. She shows how such analysis can unsettle assumptions and beliefs, as well as foster moral reflection. 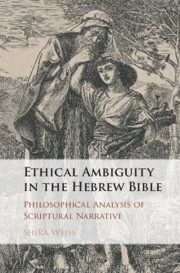 Ethical Ambiguity in the Hebrew Bible will be of interest to scholars and students of ethics, philosophy, Jewish thought, biblical theology, and exegesis. 1. Religion and morality; 2. Divine command morality; 3. Divine justice; 4. Ethics of price gouging; 5. Ethics of deception; 6. Ethics of spy seduction; 7. Conclusion; Appendix: ethics of treatment of war captives. Shira Weiss is the author of Joseph Albo on Free Choice: Exegetical Innovation in Medieval Jewish Philosophy (2017), in addition to articles in Jewish Quarterly Review, the Journal of Religious Ethics and the Journal of Jewish Ethics. She has been awarded fellowships by the John Templeton Foundation in philosophic theology and interfaith science/religion projects, respectively, as well as an NEH summer fellowship in Medieval Jewish Philosophy.